The average age at which people in the UK first become obese is decreasing, figures show. University College London researchers looked at data from more than 56,000 people born in Britain between 1946 and 2001. They found a clear shift over time, with obesity becoming more common and starting earlier in life. The latest data, however, suggests childhood obesity may now be stabilising among the under-10s. But it is too early to say if this will continue. Public health officials have said they are concerned. Obese children often go on to be obese adults, carrying with them an increased risk of heart disease and diabetes. Prof Rebecca Hardy and colleagues looked at five generations of Britons and reported their findings in the journal PLOS Medicine. The first, post-War male babies, did not become overweight until they hit the age of 40, on average - the report said. But the next two generations of men got fatter younger - at a median age of 33 and 30, respectively. The trend was the same for women. By the third generation - babies born in the 1970s - the median age for becoming overweight was 41, compared with 48 for those born in 1946 and 44 for those born in 1958. By the fourth generation, obesity was becoming common in childhood. Children born since the 1980s were up to three times more likely than older generations to be overweight or obese by the age of 10. Latest figures for England suggest a fifth of children joining primary school are now obese or overweight. Prof Hardy said: "Our work shows this coincided with the onset of an obesogenic environment in the 1980s, where there was easy access to high-calorie food. "The onset of obesity has been getting earlier and earlier and this does have implications if people are not losing that weight. "Being overweight over a lifetime means you accumulate risks for things like heart disease and diabetes." 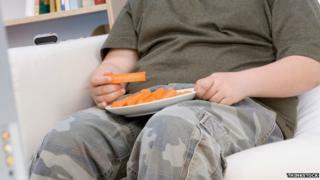 Eustace De Sousa, national lead for children, young people and families, at Public Health England, said: "Evidence shows that children of obese parents are much more likely to have weight problems, which is a major concern when almost two-thirds of adults are overweight or obese. "Almost one in 10 children in Reception are obese - but what's even more shocking is that by the time they leave primary school, this doubles to nearly one in five." The government has already launched a number of initiatives to help people eat more healthily and be more active. It estimates that health problems associated with being overweight or obese cost the NHS more than £5bn every year.